Since the advent of FUE Method a lot of development had occurred….. In the initial stages a transplant of 500 to 600 follicles was a big thing,and then on the merits of the FUHT Method,FUE Method used to loose the battle of positive credits, but as 10 to 13 years more passed those doctors,Who were extracting 500 to 600 follicles,practiced their skills to take out 2000 to 3500 in a Single sitting. I believe that such a change is usually seen in upcoming promising branches of surgery. And plasma ( human or prepared). Any way this is true that the follicles should not be made to wait too long,outside the body. Tell an increased number of follicles to the patient,say putting 2500 and mentioning 3000 . Not giving any written and transparent account of the job they have done to patient. On two or three different dates far from each other. Two or three different sittings on two or three consecutive days. As a patient and as a part of the doctor team I want to throw some light on this very important issues. What happens when we decide to give a patient 3000 follicles to day ,and will call him again the very next day to give him 2000 or 3000 more, in this case when the patient is coming to the clinic next day,inflammation had set up in the donor as well as the recipient areas, and now to harvest or transplant more follicles from and to, the area used the last day is difficult due to biological barriers. My point of emphasis is ” what is the NEED??. Science says do your best in the first day,and if you feel to give more follicles as per patient’s need ….. Call him some other date …. after one or two months..
Till the inflammation has subsidised.. Giving local anaesthesia to the patient on two consecutive days is not humanly and good for the wellbeing of the patient… it may sometimes cause severe hypokelemia…. Second procedure over the same area, will harm the previously planted follicles ad mechanical trauma and electrolytes diffusion from the cell membrane..
We can earn the bread by working ethically also, I am scientifically against the practice of two session instead I will put emphasis on practice more follicles in single sitting. 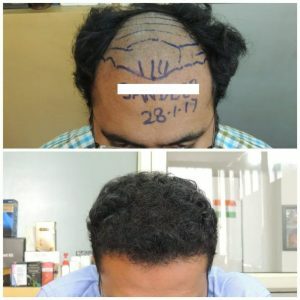 Next What age is correct for a Hair Transplant.